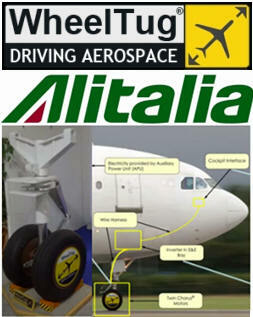 April 26, 2012 - Alitalia and WheelTug announced the signing of a partnership to introduce an innovative electric drive system for taxiing the Airbus A320 family of aircraft. Alitalia is the main Italian airline with 25 million transported passengers (in 2011), with an operating fleet of 146 aircraft and a network of 95 destinations in Italy and in the world. The patented WheelTug electric drive system consists of an electric motor called "Chorus" installed in the aircraft nose wheels and powered by the APU (Auxiliary Power Unit), the auxiliary engine installed in the tail of aircraft which provides energy to the on-board systems when the main engines are off. The equipment allows aircraft to taxi both forwards without the use of main engines and backwards without the use of a tow tug. The Chorus electric motor allows the movement of the aircraft from the departure gate to the runway, and upon landing, from runway exit to the stand for passenger disembarkation. This new technology, which is unprecedented in commercial aviation, allows up to an 80% reduction in the fuel consumption for aircraft ground movements, with a significant reduction in cost, noise, and environmental impact. The use of the Chorus electric motor also makes the aircraft independent from the tractor for push back, helping to increase operational flexibility and improve on-time operations. With the agreement announced today with WheelTug, Alitalia becomes the launch customer for this innovative technology, having reserved 100 WheelTug systems for its A320 aircraft. The Airbus A350 is a family of long-range, wide-body jet airliners under development by European aircraft manufacturer Airbus. The A350 will be the first Airbus with both fuselage and wing structures made primarily of carbon fibre-reinforced polymer. It will carry 270 to 350 passengers in three-class seating, depending on variant. Through this partnership, Alitalia continues its commitment to technological innovation, economical and environmental sustainability and improving quality standards. For WheelTug this agreement represents a key opportunity to spread this innovative technology to the best-selling aircraft family in the world. WheelTug is represented in Italy by G&G Aviation, a consulting company serving airlines, airports, training centers and executive operators. WheelTug is a Gibraltar Corporation.